Lots of blowouts in Round 1 means the competition could be stiff in the quarterfinals. 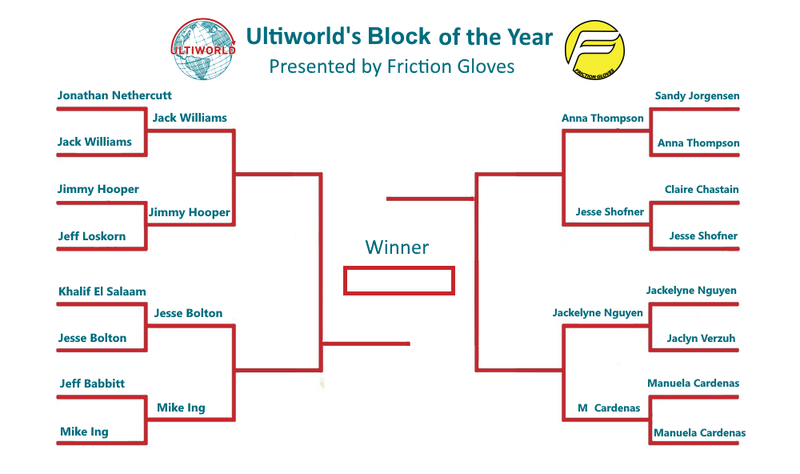 Ultiworld’s 2017 Block of the Year bracket is presented by Friction Gloves; all opinions are those of the author. Please support the brands that make Ultiworld possible and shop at Friction! Far moreso than in our Catch of the Year bracket, Round 1 produced a clear set of winners to advance to the second round. Will the picks remain stratified in the quarterfinals or will margins get tighter as we get deeper into the competition? Voting for Round 2 will be open through the weekend, closing on Monday, February 12th, at 12 PM Eastern. In Round 1, Jack Williams flew by his opponent, Jonathan Nethercutt, with nearly a 70% margin of victory—the biggest blowout of the opening round. Can his gravity-defying layout block from Easterns do it again in Round 2? Jimmy Hooper’s catch block may have been a late addition to the bracket after an editorial error accidentally misidentified a missed huck as a D, but he made the most of his inclusion by earning a first round victory over Jeff Loskorn in a matchup that garnered more votes than any other. Now he’ll face stiffer competition, vying for a spot in the semifinals. Bolton slid past his teammate in the first round of this competition, in one of the tighter matchups thusfar. His footblock is the most unique clip remaining in contention, awash in a sea of athletic layouts. Will that be enough to lead him to victory in the quarterfinals? Just as he did in the clip, Ing got the better of an opponent from UMass in Round 1, comfortably easing past Jeff Babbitt. Next comes a matchup with a foe who played at another powerhouse college program. As was the case with Olga Podolskaia’s final-worthy grab in the Catch of the Year bracket, the context of Thompson’s block clearly mattered to voters in the first round, as her Club Championship double game point block absolutely thumped an impressive nominee from the incomparable Sandy Jorgensen. Thompson’s crazy good 2017 continues on in this competition. Also besting Jorgensen, Jesse Shofner nabbed the biggest victory on the women’s side of the bracket in Round 1, knocking off club teammate Claire Chastain with almost 80% of the vote. Her Round 2 matchup with Thompson pits two pint-sized powerhouses who both play much bigger than their size would suggest. While there is some question as to whether Nguyen’s effort is actually a block—it has been pointed out that observers upheld a foul call on this play—our readers deemed it clean enough to earn a spot in the second round. Getting by Manuela Cardenas, however, may be a different story. FINALLY, Manuela Cardenas tasted defeat in a Block of the Year competition, her undoing coming at the hands of…well, Manuela Cardenas. Having already dispatched of perhaps her toughest competition,1 the Colombian is poised to make another deep run in this bracket, facing off next against an opponent who might just be able to match her athletically. Comments on "Ultiworld’s 2017 Block Of The Year Bracket: Round 2, Presented By Friction Gloves"